This guy isn’t as clear-headed as Eric Kraus, is he? But does have company in the form of Andrew Miller, Jeffrey Tailer, “Streetwise Professor”, and Ed Lucas. H/t Mark Adomanis. Jim Rogers, a famous international investor and writer attended HBS this Wednesday. In his speech, he badmouthed Russia (in his usual style) and quoted several “facts” that were completely bogus. As you would expect, I could not let him get away with lying about our country and publicly disputed his factual claims. He basically told me I was a moron and left. In response, I sent an email to him with facts and references disputing his claims (sending a copy to my HBS classmates). What ensued is quite amazing – read attached emails. Start with the first email and read from the end (my original email), then read his response and finally my rebuttal in the second email. This will be worth your time I promise. This has already been circulated all over HBS, several other universities and in the investment community in New York. Since this is already in public domain, feel free to forward on. Dear Mr. Rogers: I am the “lad” who disputed your factual claims with regard to Russia today. First of all, I would like to thank you for speaking to us at the Harvard Business School. I think I speak for my fellow HBS students when I say that we enjoyed your original views and interesting stories today. However, I must address the unfortunate reality that your facts about Russia are plain wrong. You made three principal inaccurate claims today – I will deal with all of them in sequence. Wrong. In fact, according to Financial Times, your favorite newspaper, Russia turns out to be the second largest recipient of immigrants after the US (see attached FT article). Oops. While it is true that Russia’s population is declining but the reasons for that have nothing to do with people leaving the country, it is things like low birth rate (only 1.2 per woman), which is an issue that confronts many European states. Wrong and wrong. Russian oil production has increased for the fifth year in a row (see attached Reuters article), and Russian oil majors are reinvesting in production (many of them have US GAAP accounts audited by Big Four firms you could easily have access to if you chose to look). Wrong again. Equity indexes (US Dollar denominated) are trading around their all time highs (see attached Barrons article), Russian bond yields are at historical lows. As an experienced investor, surely you will recognize these as pretty convincing signs of investor confidence. 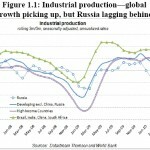 Source: http://www.worldbank.org.ru GDP growth of 21%? Hardly a picture of total collapse, don’t you think? Conclusion I believe the facts speak for themselves. I have no time or desire to try to convince you to invest in Russia. However, I do kindly ask you to abstain from spreading inaccurate information. You are a public figure and many people including future leaders at Harvard Business School listen to you; it would be very unfortunate if they were misled by your inaccurate statements. Finally, if nothing else, it is not good for your own public image. Thank you for coming and for writing. My goodness. Not only do you have no idea about what you are speaking, we now know you cannot read. The “immigration study” you mention was a bunch of estimates for the years 1970 to 1995. What the hell does that have to do with Russia in the past 8 years? Many were forced to go into Russia from the Soviet Republics under the Communists, but that was hardly free immigration as in the other countries. Even if people were going into Russia in the early 1990s, they were Russians being forced to leave the old USSR republics as the USSR dissolved in the early 1990s and those Russians fled back into Russia. You have demonstrated you cannot read nor analyze nor have any concept of what is happening in Russia today, but do you not at least know a little Russian history? Oh my. You really should have kept your mouth shut and stopped long ago. This is not from “Reuters”. It is from the Russian government – the same group which claims to have had a balance of trade surplus for the last 9 years. The same group of bureaucrats and charlatans who became a laughing stock with their “facts” under the USSR. The same who say that the Russian balance of trade in that period has been among the largest in the world. I did not think even B school students fell for that claptrap any more. But then you are the one who says the ruble is a good buy and that “it is a strong currency”. I suggest you check your facts on what has happened to the ruble in those 9 years when Russia “had the strongest balance of trade surplus in the world”. And that was a period when huge sums were also flowing in from the World Bank, IMF, etc, etc. “Inflows from the strongest balance of trade in the world and billions from the World Bank, etc” yet the currency kept declining. I and most others find that extremely strange. Somehow or another the currency kept falling since most of us realized the same old bureaucrats were spewing out the same old garbage. I guess you were buying rubles all that time. No wonder you are in school rather than making it in the real world. You must have gone broke buying all those rubles. And if Russian oil production is really up so much, why is the price of oil still so high? So you are indeed a gullible lad, but fortunately the market knows a lot more than you and your wailing into the wind. You might read the section of my book about Russia’s reported figures – especially the trade figures. Or get some one to read it to you and explain it to you. I know you said you have driven across Russia from the Pacific to Europe, but I’d like to know your route and which border crossings you used and who you found out there counting all this stuff. You really should have kept your mouth shut, but since you opened it: What balderdash. Now we know you have no understanding of markets in addition to being unable to read or comprehend. The Russian “market” is tiny and is insignificant compared to GNP so it is meaningless. Even your article points out that the few big hydrocarbon companies account for 70% of the stock market. [a] The price of oil more than doubled in the period the article discusses and [b] those stocks went up because of that and because of the manipulation by the oligarchs. Perhaps you did not notice your article mentioned the “murky” dealings in Russia? I hardly consider 2 mutual funds and 4 or 5 manipulated oil stocks “as pretty convincing signs of investor confidence”. But if you really believe all this codswallop, why are you in business school? Why aren’t you there making your fortune? I presume you are long the Russian stock market? For what it is worth, I was short the ruble and the Russian market in the summer of 1998 and back in the earlier bubble in the mid 1990s when Russia and its bureaucrats were going on and on with the same absurdity. Go back and look up what happened both times. Or perhaps you were long then too and got wiped out which is why you had to go to b school. Need I go on? No one has ever stayed solvent much less made money listening to the World Bank [except business school professors who “consult” for them]. Oh dear, you get your information from the Russian government and the World Bank!? Are you mad? I know you say you have driven across Russia, but who do you really think is out there in those 11 time zones and tens of thousands on kilometers of Russia collecting all this “reliable data”? And thanks for your advice about my analysis, facts and my “public image”. If you had done your homework, you’d know the public was and is extremely aware that I had shorted the ruble in 1998 and back in the mid 1990s [when I guess you were long]. It was the same kind if misinformation back then too that gullible souls like you swallowed. And the public is extremely aware of my record of investing in many markets all over the world for many years. You might read John Train’s Money Masters of Our Timeor one of several other books. I do not worry about it, but you should worry about yours. But as for public image and inaccurate statements, you have demonstrated quite publicly and vocally that you can neither read nor comprehend what you read nor can you analyze anything in front of you and that you fall for anything someone tells you and that you have absolutely no knowledge of even recent Russian history. I was terribly embarrassed for you when you stood there babbling on in front of the others about the strong ruble – a currency which has been nothing but a catastrophe for a decade [despite your painfully absurd statements], but now you have shouted your hopelessness from the roof tops for all to see. I hope your classmates will pull you aside and pass on this word of advice: It is better to remain silent and have people wonder if you are an idiot rather than to open your mouth and prove to everyone in sight that you are an idiot beyond all doubt. And one should never, ever go shouting from the rooftops when one is a total idiot because then the entire school knows it. I see that you prefer the language of personal insults instead of informed polite discussion. Well, this is your choice and I hope this is not consistent with your sense of style – you are a successful individual (as you mentioned many times) and it would be a shame to tarnish that with this sort of attitude. Also, apologies for getting you a little riled, I didn’t mean to, nor did I expect you to. I am enjoying the discussion and would like to just rebut some of your remarks. [immigration] My goodness. Not only do you have no idea about what you are speaking, we now know you cannot read. The “immigration study” you mention was a bunch of estimates for the years 1970 to 1995. What the hell does that have to do with Russia in the past 8 years? Many were forced to go into Russia from the Soviet Republics under the Communists, but that was hardly free immigration as in the other countries. Even if people were going into Russia in the early 1990s, they were Russians being forced to leave the old USSR republics as the USSR dissolved in the early 1990s and those Russians fled back into Russia. For your viewing pleasure, below are the actual numbers of net migration (immigration less emigration) through 2001. As you can see, there is a net inflow in every single year for the past two decades. This does not even include an estimated 1-1.5 million of illegal immigrants to Russia. As you correctly point out, much of the immigration comes from the states of the former Soviet Union (although a very large part of the immigrants are Ukrainians and other CIS nationals). However, the fact remains that before and after 1995, immigration to Russia far exceeded emigration from Russia, which is the opposite of your original claim. “A turnaround in Russian oil output began in 1999, which many analysts have attributed to rising world oil prices during this period (oil prices tripled between January 1999 and September 2000), as well as a number of after-effects of the 1998 financial crisis and subsequent devaluation of the ruble in August. Today, Russian oil fields are maintained using modern technologies from around the world, and many of the old command economy institutions have been streamlined. The rebound in Russian oil production has continued since 1999, resulting in 2002 total liquids production of 7.65 million bbl/d (7.4 million bbl/d of which was crude oil)–a 26% increase over the 1998 level. Accordingly, Russia is now the world’s second largest crude oil producer behind only Saudi Arabia. Or do you think the US government is also lying? became a laughing stock with their “facts” under the USSR. The same who say that the Russian balance of trade in that period has been among the largest in the world. I did not think even B school students fell for that claptrap any more. I don’t think my fellow students deserve this condescending treatment. You should also know that my other Russian speaking HBS classmates were appalled by your comments in and after class. In addition to misstating the facts, you also characterized the country in an offensive manner. We are all rational people and are prepared to discuss the Russian economy and culture on merits (clearly, there are many negative things, particularly in the recent past) but it’s a very different matter when someone starts insulting a nation. But then you are the one who says the ruble is a good buy and that “it is a strong currency”. This is not quite the statement I made, but nice try at remembering. What I said was that this year, Russian currency appreciated and I stand by my statement. From 31.7 rubles/US$ at the end of 2002 it appreciated to 30.7 rubles/US$ now. I did not say it is a strong currency and I certainly don’t think that any currency is a good investment given that currencies are not interest bearing. I suggest you check your facts on what has happened to the ruble in those 9 years when Russia “had the strongest balance of trade surplus in the world”. And that was a period when huge sums were also flowing in from the World Bank, IMF, etc, etc. “Inflows from the strongest balance of trade in the world and billions from the World Bank, etc” yet the currency kept declining. I and most others find that extremely strange. Somehow or another the currency kept falling since most of us realized the same old bureaucrats were spewing out the same old garbage. I guess you were buying rubles all that time. No wonder you are in school rather than making it in the real world. You must have gone broke buying all those rubles. I find it amusing that you would ask this question. Surely you know that market prices are determined by many factors including demand (which, as you correctly pointed out in your speech, is on a secular upward trend), supply by other players (think Latin American and Middle East supply problems). Russia is one of the global energy suppliers and certainly cannot by itself control world energy prices. Surely you must know this? You might read the section of my book about Russia’s reported figures – especially the trade figures. Or get some one to read it to you and explain it to you. I know you said you have driven across Russia from the Pacific to Europe, but I’d like to know your route and which border crossings you used and who you found out there counting all this stuff. If this is not a reliable sign of investor confidence, I don’t know what is. But you probably think these companies are lying, too? Or are they also being manipulated by evil oligarchs? Let me know if you desire to see my bank statements and resume, I’ll email them to you. I think you’ll be pleasantly surprised, maybe even compare them to yours when you were my tender age, for a real awakening. Maybe we can do the same when I am your age now, and we can revisit this cute discussion. Rest assured, I certainly plan on continuing my career in Russia because I love the place, I am good at what I do and I will have a positive impact on the country. Surely, there are challenges and problems (name a place in the world that does not have a set of problems to deal with) but the opportunities are amazing. I find it extremely satisfying to be able to effect real change in the largest country in the world. I presume you are long the Russian stock market? That’s correct. While one may or may not agree with the World Bank’s adjectives and characterizations, there are objective facts and figures that speak for themselves. Do you think that 21% real GDP growth is a sign of total collapse of the economy or do you think that the government and international finance organizations are lying about the figures? Need I go on? No one has ever stayed solvent much less made money listening to the World Bank [except business school professors who “consult” for them]. Oh dear, you get your information from the Russian government and the World Bank!? Are you mad? I know you say you have driven across Russia, but who do you really think is out there in those 11 time zones and tens of thousands on kilometers of Russia collecting all this “reliable data”? Every “babushka” shorted ruble during that time period; it was a highly inflationary currency. The funny thing is that Jim Rogers is now an adviser to an agricultural fund run by Russian state-owned banking group VTB.